The New York Yankees won their second straight World Series, and beat the Braves franchise for the third consecutive time (having defeated the Milwaukee Braves in their 1958 Series). The 1999 World Series also featured the All-Century Team, featuring the greatest players of the Twentieth Century voted by both the fans and sportswriters. One of the players on the All-Century Team, Yankee legend Joe DiMaggio, had died in March of that year, causing the Yankees to honor him by wearing a black #5 on their sleeves. This featured a rematch of the 1996 World Series. It would also be the last World Series until 2013 in which the two teams with the best regular-season records in their respective leagues would face off. Perhaps most significantly, it was the first World Series ever in which the competing teams had played each other in the regular season. Although interleague play had begun in 1997, neither the 1997 nor 1998 series saw a rematch from the regular season. The 1999 series opened with Greg Maddux facing Orlando Hernández in Game 1, becoming the latest a World Series has ever begun (October 23) beating the previous record by 2 days (1995 World Series, October 21). The Braves got on the board first in the series when Chipper Jones launched a home run down the right field line in the fourth.inning That would be the only hit that El Duque would allow through seven innings while striking out ten Atlanta batters. Maddux pitched scoreless into the eighth before running into major trouble, which began when Scott Brosius singled for the third time in the game. Pinch hitter Darryl Strawberry walked and Chuck Knoblauch reached when Braves first baseman Brian Hunter mishandled his sacrifice bunt attempt. Derek Jeter stroked a single into left with the bases loaded driving in a run. With still none out and the bases juiced, Atlanta reliever John Rocker gave up a two-run single to Paul O'Neill through the right side making it 3–1 Yankees. Later in the inning, Rocker walked Jim Leyritz with the bases loaded to force home another run. Mariano Rivera picked up the save to wrap up the 4–1 victory. Game 2 featured the presentation of the All-Century team and an explosion of Yankees runs off Atlanta starter Kevin Millwood. In the first inning, Knoblauch, Jeter, and O'Neill opened the game with singles with O'Neill driving in Knoblauch. After a double-play groundout, both Tino Martinez and Scott Brosius drove in a run with singles each to give the Yankees a 3–0 lead in the first. In the third, Bernie Williams and Martinez hit leadoff singles before the former scored on Ricky Ledee's double. Terry Mulholland relieved starter Kevin Millwood and after getting two outs, shortstop Ozzie Guillén's error on David Cone's ground ball allowed Martinez to score. The Yankees added to their lead off of Mulholland on Martinez's groundout that scored Jeter in the fourth, who led off the inning with a double, and Knoblauch's single in the fifth that scored Brosius, who also doubled to lead off the inning. Cone shutout the Braves for seven innings while Ramiro Mendoza pitched a scoreless eighth, but in the ninth, allowed a leadoff single to Chipper Jones. After a two-out walk, Jones scored on Greg Myers's single. Jeff Nelson relieved Mendoza and allowed an RBI double to Bret Boone before getting Otis Nixon to ground out to end the game and give the Yankees a 2-0 series lead. This was the last victory of a World Series Game 2 on the road until the Texas Rangers won Game 2 of the 2011 World Series in St. Louis. Golfer Payne Stewart, a good friend of Braves third baseman Chipper Jones, died between Games 2 and 3. Yankees right fielder Paul O'Neill's father died a few hours before Game 4. Game 3 in New York matched up lefties Andy Pettitte and Tom Glavine, and Pettitte was rocked early. Bret Boone drove in Gerald Williams with a RBI double in the first. The Yankees tied the game in bottom of the inning on Paul O'Neill's RBI single, but in the third, Brian Jordan had an RBI single scoring Boone, and Jose Hernandez doubled in Jordan and Andruw Jones. In the fourth, Bret Boone doubled in Gerald Williams for a second time in the game to make the score 5–1. Glavine was sharp but gave up homers to Tino Martinez and Chad Curtis in the middle innings, trimming the Braves lead to 5–3. The Yankees bullpen was solid, holding the Braves scoreless after Pettitte left the game. In the eighth, Glavine surrendered a two-run homer to Knoblauch to tie up the game at 5–5. The score remained knotted until the bottom of the tenth when Chad Curtis blasted a walk-off home run—his second home run of the game—off Mike Remlinger, giving the Yankees a commanding 3–0 lead in the Series. Game 4 featured the presentation of the Roberto Clemente Award to Tony Gwynn, followed by a battle of hard-throwing Cy Young Award winners, Roger Clemens and John Smoltz. In the third inning, the Yanks broke through when Tino Martinez singled off Ryan Klesko's foot with the bases loaded, driving in two runs. Jorge Posada followed with another RBI single, making the score 3–0. Clemens, seeking his first World Series victory, was outstanding, the only Braves scoring coming in the eighth when Boone singled in Walt Weiss. Jim Leyritz added another Yankees run with a shot in the eighth, adding to his legacy as a great postseason performer and as one of the thorns in the side of Braves fans. Rivera, who was named Series MVP, got Keith Lockhart to fly out to LF Curtis for the final out of the season. The 1999 New York Yankees became the first team to win the World Series in consecutive sweeps since the 1938–1939 Yankees. It was the first sweep by a team without home-field advantage since 1966 when Baltimore swept the Dodgers. The Yankees' 11–1 postseason record was the best ever, tied by the Chicago White Sox in 2005. The Yankees players were each paid $326,000 for this World Championship. 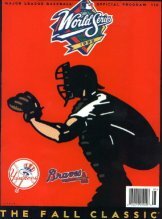 With the Yankees' sweep of the Braves, this was the second time in 1999 that a New York City team had swept a team from Atlanta out of a playoffs; the Knicks had swept the Hawks in the second round of the NBA Playoffs during their Cinderella run to the NBA Finals, where they lost to the San Antonio Spurs. It would also mark the final time the Yankees clinched the championship at the old Yankee Stadium. The powerhouse Braves batted just .200 in the 4-game Series. 1999 World Series (4–0): New York Yankees (A.L.) beat Atlanta Braves (N.L.). This was the 5th World Series appearance in the 1990s for Atlanta, but the new decade would not be as favorable to them. To date, the 1999 World Series is the last World Series appearance for the Braves. The Yankees would continue their dynasty by defeating the New York Mets the next year and winning a fourth straight pennant in 2001, but they lost to the Diamondbacks in that season's World Series. They would reach the World Series again in 2003 (losing to the Marlins) and 2009 (defeating the defending champions, the Philadelphia Phillies). This was NBC's 39th and, to date, final World Series telecast. Fox would air the next World Series as part of the contract in place, and acquired the exclusive broadcast rights of Major League Baseball beginning in 2001. Bob Costas provided play-by-play while Joe Morgan served as analyst for the series. Hannah Storm served as pre-game host with Barry Larkin serving as the analyst. The field reporters were Jim Gray (Yankees dugout) and Craig Sager (Braves dugout) on loan from Turner Sports. With the Knicks having played in the NBA Finals in June, this was the second championship series in 1999 that NBC broadcast involving teams from New York. Bob Costas, Jim Gray, and Hannah Storm were involved both times: Costas with play-by-play, Gray as a reporter, and Storm as pre-game host. This was the most recent year that a city hosted both the NBA Finals and the World Series in the same year, until Cleveland did so in 2016. Once again, ESPN Radio provided coverage of the World Series. Play-by-play man Jon Miller was joined in the booth by Rick Sutcliffe, who substituted for the unavailable Joe Morgan. On October 11, 2005, A&E Home Video released the New York Yankees Fall Classic Collectors Edition (1996–2001) DVD set. Game 3 of the 1999 World Series is included in the set. ^ "1999 World Series Game 1 - New York Yankees vs. Atlanta Braves". Retrosheet. Retrieved September 13, 2009. ^ "1999 World Series Game 2 - New York Yankees vs. Atlanta Braves". Retrosheet. Retrieved September 13, 2009. ^ "1999 World Series Game 3 - Atlanta Braves vs. New York Yankees". Retrosheet. Retrieved September 13, 2009. ^ "1999 World Series Game 4 - Atlanta Braves vs. New York Yankees". Retrosheet. Retrieved September 13, 2009. History of the World Series - 1999 at The SportingNews. Archived from the original on 2008. This page was last edited on 13 March 2019, at 10:43 (UTC).